In year two, coach Chris Collins hopes Northwestern can contend for a postseason appearance. With a highly ranked recruiting class, the Cats have a better chance at reaching that goal. This year’s freshman class is one of the deepest and best in program history. Point guard Bryant McIntosh and forward Vic Law are expected to start immediately, while guards Johnnie Vassar and Scottie Lindsey and forward Gavin Skelly will have chances to earn minutes. Law, a lanky wing with raw athleticism, comes in as the most hyped in recruiting rankings. But McIntosh, with his poise and court vision, might be the most college-ready of the group. Whether or not any of the freshmen are stars from the get-go, their progression will be a major indicator of the program’s future. Many think this is the group to end NU’s NCAA Tournament-less streak, and though we certainly won’t know any time soon if that’s the case, we could draw some conclusions about the program’s direction. Center Alex Olah was probably NU’s most improved player last season. Now a junior, Olah has continued to work on his back-to-the-basket game and should add to the useful jump-hook he showed off in 2013-14. After averaging 9.1 points per game last year, Olah should score in double figures, and with Drew Crawford gone, is a lock to lead the Wildcats in rebounding. With NU’s newfound frontcourt depth, Olah won’t have to play quite as many minutes as he did in 2013-14, which could keep him fresh deep into the season. It’s hard to know how many games the Cats will win in January and February, so it’s good to know they’ll find some easy wins in November and December. NU plays only one or two major conference opponents outside of the Big Ten (depending on the results of the Cancun Challenge), beginning with underwhelming Houston Baptist on Friday. Of the Cats’ 13 non-conference games, nine are at home. 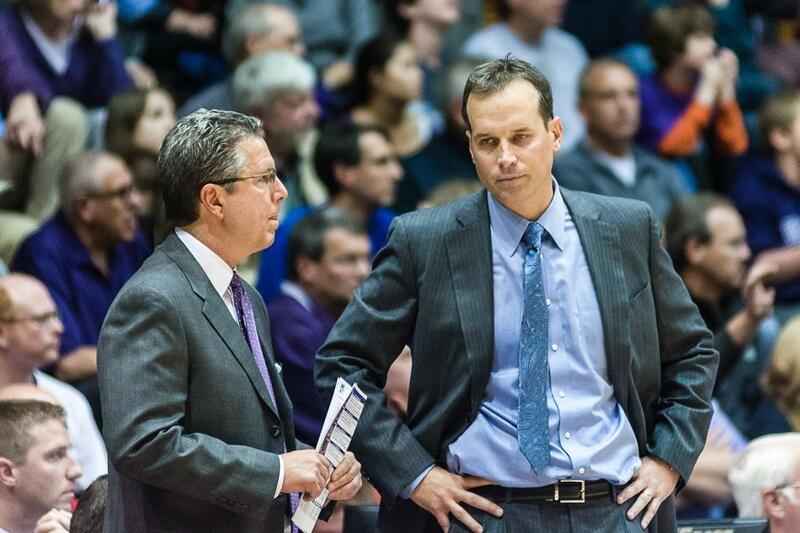 The easy non-conference slate might be beneficial for Chris Collins’ young team. In a year when NU has serious NCAA Tournament aspirations, strength of schedule will be important. But with that not really a consideration this year, there’s little harm in building confidence against lesser opponents. The tough competition the Cats need to improve awaits in Big Ten play anyway. Senior guard JerShon Cobb has a chance to close out his NU career with his first drama-free campaign. After missing time to injury in three seasons and to suspension in a fourth, Cobb can erase — or at least mitigate — the bad memories. When he’s been on the court, Cobb has been a pretty good player. He creates his own shot and defends well, and last year he shifted to point guard when necessary. This year, for the first time, Cobb will be looked to as NU’s best player and team leader. There’s plenty of room for a happy ending. Last year was Collins’ first as Cats coach, but this will be his first opportunity to work with players he brought to the program himself. With six newcomers out of 12 scholarship players, the program is rapidly becoming Collins’ own. The former Duke assistant has said from the start that he envisions NU eventually playing an up-tempo offense far different from the plodding one he orchestrated last year. With the new personnel, Collins will be able to push the Cats away from what they looked like before his arrival and toward how he hopes they’ll look down the road. Collins stamping his identity on the program will be a story to watch this season and beyond. Correction: An earlier version of this story misstated the academic year in the headline. This story is about the 2014-15 season. The Daily regrets the error.